French farmers have launched a major protest in Toulouse this week, blocking main routes into the city in protests against changes to a land classification scheme which would result in cuts to the rolls of those eligible for subsidies. Tyres were set on fire, farm waste was dumped across roads and at least one rail line, and tractor demonstrations were held around the city, causing major disruption across the city with motorists warned not to drive into the city centre. The French National Federation of Farmers’ Unions (FNSEA) was behind the protests, sparked by Government proposals which would have seen nearly 500 rural communities in the southwest Midi-Pyrenees region lose their status as a disadvantaged zone. After negotiations in mid-week, the government has assured the strikers that the number of Midi-Pyrenees communities that would be cut from the rolls would be reduced to 182, and the authorities will be presenting their revised version of the map today. The negotiations between the French Government and unions over changes to the scheme have been underway since 2016, but last Wednesday (February 7) was the most intense day of protesting in Toulouse. Travel in and out of Toulouse was almost impossible, with motorways brought to a standstill. 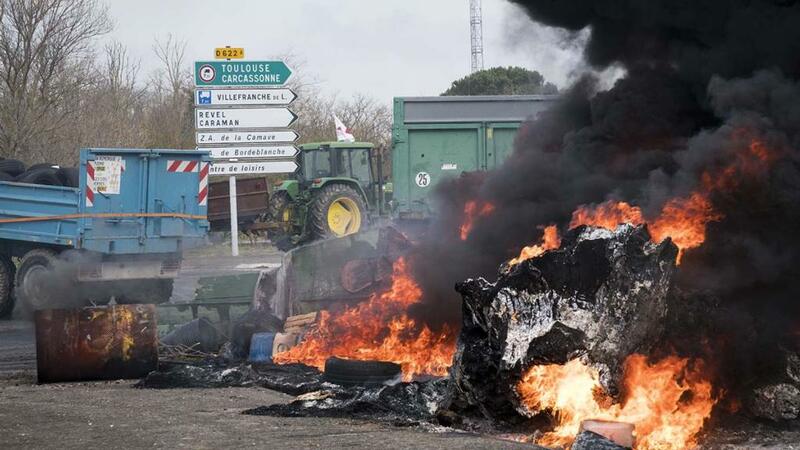 FNSEA said farmers in the Deux-Sevres and Centre Val-de-Loire regions were also mobilised. It called for farmers to fight in Brussels and Paris every day and at every meeting to make the public authorities see reason. The map of “zones défavorisées” determines eligibility to for subsidies worth more than EUR 1 billion per year. Protestors warn they could go out of business without the payments. Sophie Maniago from the FDSEA farmers union told The Local France they were very motivated not to give an inch. "It is the death of the farms. We would have losses between €8,000 and €10,000 euros. The French minister of agriculture met with the protesters Wednesday and Thursday, which led protesters from some areas to declare themselves satisfied, notably around Toulouse, where the temperature had cooled down somewhat by Thursday. However, others remain mobilized, including in the departments of Aude and Averyon.